Ahh this is it! 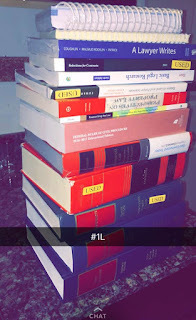 It's so exciting for me to see a lot of y'all starting your 1L year after spending almost a year trying my best to help y'all know what to expect and answer any questions. I know some of y'all won't start for another week (hate you) and others of y'all have already started your 1L year, but my first week starts on Monday so I'm posting about it now. 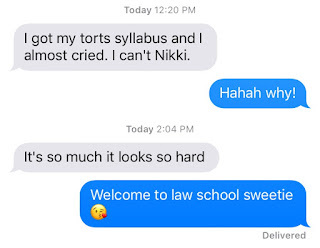 The first week of law school is exciting because you're officially a legit 1L after that first class, but I know it can be really stressful trying to pretend like you're not the most clueless person in your section. I'm not as nervous as y'all because this is my 3rd semester of this gig, but I am still nervous because once again it's a new school where I know like no one, new professors that I don't yet know if they're hard or not, and a new school system so I don't know where to find things or what things are. So I'm still in the boat with you and will be taking my own advice for this week. I've mentioned how I've slowly shifted from writing out briefs to relying on book briefing and Quimbee, but as a fresh faced 1L I wouldn't recommend that to y'all. Until you know what your professor does and doesn't want, make sure that you're carefully reading the book and making briefs for every assigned case. The briefing doesn't have to be printed out or anything fancy like that (unless your professor asks) but do make sure you're bringing them to class. Those first few weeks are terrorizing as you wait your turn to be called on, so for your first time it'll really help if you have the answers literally written out in front of you. Ok now there's a difference between adding substance to a lecture and talking just to talk. There was a girl in my section last year who raised her hand all the damn time and I'm pretty sure it was just because she'd been told that's what you need to do to make a good impression. But you're not going to be making a good impression if you're annoying your professor. I suggest sitting towards the middle of the row a few rows back so that you're easiest to see for your professor. Yes this is a scary place because you can't avoid the professor if you don't know an answer, but they usually call on people with their hands raised so don't let this intimidate you. If on your first day you're thinking plz send help, then it's ok to wait until the second class when you feel more comfortable to speak up. Just make sure you at least try because law school is the kind of place where you really don't want to squeak by unnoticed. 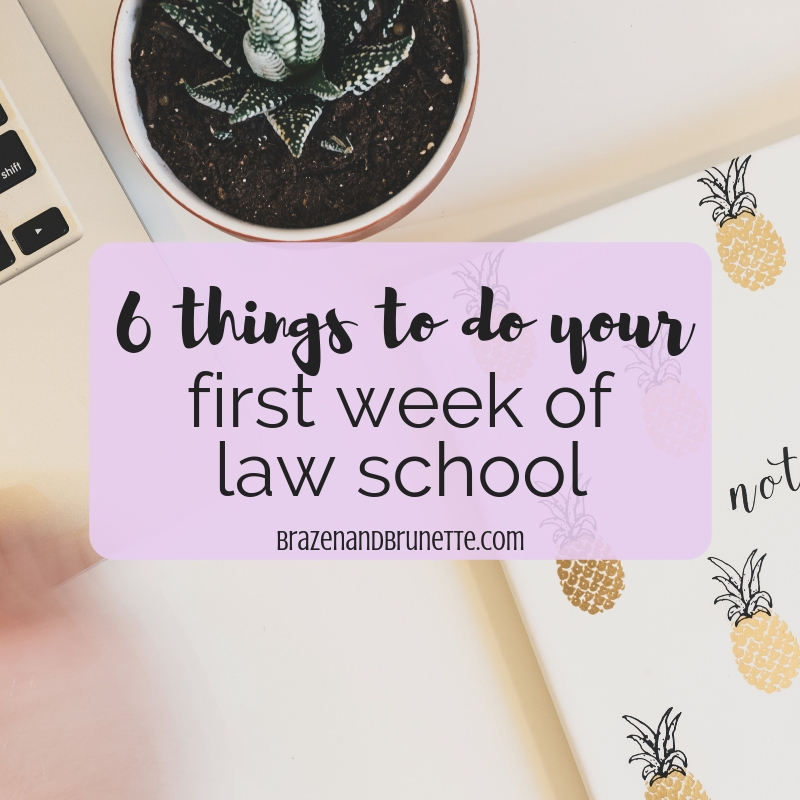 The first week of school is a busy time because that's when you start hearing about student organization meetings and pro bono opportunities and internship information. Keep your planner updated because if there's a meeting that you have to go to, you'll need to adjust your reading schedule to make sure that one day isn't super overwhelming. On that note, deadlines in law school are no joke so I strongly advise you to put any important due dates (thanks, LRW) in your phone calendar with a first alarm to remind you of it at least 1 day in advance and a second alarm to remind you at least a few hours before the deadline. I'm saying this from experience as the girl who meant to turn in a paper but forgot to do so until midnight when the deadline was 5PM. When there's such a strict curve there's a good chance that a mishap like that will be what takes you from a B to a B- which could also move you down in your class rank. Just make the alarms and it'll be fine. First things first, you need to add your email to your phone, computer, iPad, whatever. It still baffles me that as full fledged adults there will still be someone who didn't read the email a professor sent out at like 6 that morning and will blow up the class Facebook page asking where everyone is. 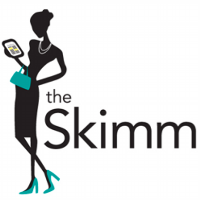 Every morning to wake myself, I check my school email, the Skimm, and the weather while still in bed. Then I'm ready for the day and if a class has been canceled I can adjust my alarm and go back to sleep. I'm sure most of y'all do that anyways, but because you're probably at a new school just check to make sure that your phone or whatever is properly receiving and sending emails before the year really gets started. just so that when you email a professor or potential employer, they'll know exactly who you are and how far along you are in school. If you've decided to be in a study group, nows the time to get that up and running. If you didn't set that up during orientation, that's fine but you should get it together before everyone commits to somewhere else. At first you really won't need to be meeting too often, because there's nothing really to go over and study. But if y'all feel like it you can go ahead and get together to talk about when you're going to meet or if you need to ask any questions about anything that you're confused about in class. Law school is the fastest schooling I've ever experienced. I know this first week is super overwhelming because you're trying to read everything at first, but trust me when I say take a damn break and go for a jog or something to get your mind off school. I'm telling you right now that if you think Oh I'm just so busy this week I'll wait until next week, then you my friend are probably going to look up one day and realize that it's October and your life has slipped into a law school coma. Law school can be an adjustment so just try to find a way to not freak out 24/7. What a crock! Don't tell me in all your (or anyone's) years of schooling you never got called on without raising your hand. I'm sure you gave oral presentations, too. I get where you're coming from; I was referring to the first week of law school where if a bunch of people raised their hands to answer a question posed to the entire class, that's who my professors would pick to try their best shot. Obviously you get cold-called and have to talk about a case even if you didn't raise your hand, but in my experience professors chose who to cold-call from a list or another randomized way instead of just picking people sitting in their eyesight. I only gave one oral presentation in law school when I was a 3L, but maybe I just took different classes than you did. Everyone wants to reverse the age with ease, so it is necessary for the body to have good proportions of collagen. So, check the latest launch by Healthy Living Association, named "American Natural Super Collagen". Proflexoral is a leap forward natural dietary enhancement that gives patients moment help from joint in-flexibility and torment, eases irritation, supports physical development, and recreates your ligament and joint material that falls apart as you approach age. This is almost exactly what I did my first week.